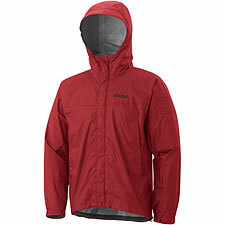 Marmot calls the PreCip Jacket 'full-function value-added rainwear.' Given the PreCip's bargain price, the value is easy to see. As to the question of function, the PreCip is a seam-taped waterproof/breathable shell that sits (like TNF's excellent Venture Jacket) somewhat ambiguously between plain nylon rain gear and technical outerwear. Compared to the Venture Jacket, the PreCip feels a tad more like rainwear than mountaineering shell: Marmot's PreCip™ fabric is softer in hand and more compressible. The PreCip jacket is also marginally lighter. Obviously, being fully waterproof and breathable places the PreCip Jacket in competition with expensive Gore-Tex shells, offering superior performance and especially comfort over coated but airtight rain gear. Nonetheless, you get a host of features more commonly found on expensive gear, such as "Angel-Wing" arms which allow a full range of motion (climbers will like this), a double storm flap over the zipper with a soft wicking fabric to protect your chin, and underarm pit zips for enhanced breathability. The feature set also includes a draw cord waist, a "full visibility" roll-up hood, extra internal volume to fit well over inner insulation like fleece, and a cleverly-designed integral collar (a desirable feature the Venture Jacket specifically lacks). With a wide range of available color and size options, the PreCip Jacket targets not only backcountry travelers but also urban wanderers—or anyone looking for a stylish, inexpensive rain coat. If rainwear is all you're seeking, be it for walking across town or keeping in your pack as thunderstorm insurance, the PreCip Jacket is easily an excellent choice. On the other hand, those looking to push the envelope on technical applications may find the Venture Jacket the slightly better pick. Without taking a nail to both for absolute proof, I'm going to speculate that the North Face's HyVent fabric is the slightly more durable of the two, giving the Venture a slight edge in durability for high-wear activities like Alpine Skiing and Winter Mountaineering. That said, I do use the PreCip Full-Zip Pant as my primary backcountry skiing pant, and I've had no significant issues with regard to durability after loads of use (other than my fondness for tagging them with my crampon points). Finally, durability fades as a major consideration when you remember the price you're paying for the PreCip Jacket. If you wreck it, you can always buy another...and another...and other—and you'll still save money compared to a full-price Gore-Tex shell.